Oscar Glow, Today's Tech Help Short Films Find Their Fandom Oscar-nominated short films, once all but impossible to see except at art-house theaters, are surging in popularity via online streaming and on-demand services. If you, an ordinary non-Academy member, wanted to see an Oscar-nominated short film a few years ago, you couldn't — not unless you lived in a city with an art-house theater that happened to be showing them. 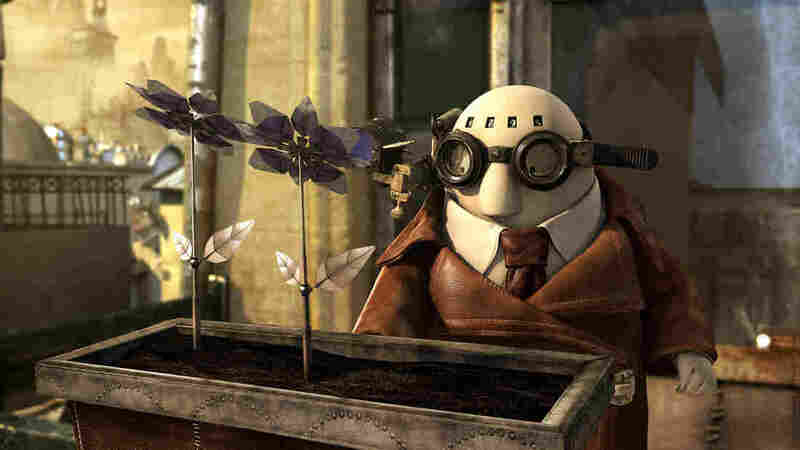 Now, if you want to see an Oscar-nominated short like Mr. Hublot, an animated gem about a steampunk Paris filled with Victorian mechanical gadgetry, all you have to do is download it on iTunes or Amazon. Or you can watch via video on demand. This year's Oscar-nominated shorts are also playing in more than 400 theaters across the country, where they've become an increasingly hot ticket. "Since 2006, we've probably had over an 800 percent increase in box office," says Carter Pilcher, president of ShortsHD, a company dedicated to making shorts more accessible. "Short films used to be kind of out there, and nobody saw them. I would say the technology has caught up with content." Now we have YouTube, among other things, and it's created an insatiable appetite for short, easily digestible chunks of content we can watch on our mobile devices. And over the past 15 years, shorts have been redefined by Pixar. It's hard to remember now, but Pixar used to be mainly a hardware company, and one that was teetering on bankruptcy. Its owner, one Steve Jobs, hired someone to show off what its animation technology could do. That someone, John Lasseter, thought, "Why not shorts?" He created one about a trembling little toy tormented by a sadistic oversized baby. Scientists and engineers gave that short, Tin Toy, a standing ovation in 1988 at a computer-graphics conference, says Pilcher. "And because of that story, they were able to go on and make and get financial backing for big ones." Namely Toy Story, directed by ... John Lasseter. Since 1998, every Pixar movie in theaters has been shown with little shorts. They're fun, they add buzz. "We think of them a little like an hors d'oeuvre before the main course," says Osnat Shurer, who ran Pixar's shorts division for years. Or a digestif after. Now Shurer works for Walt Disney Animation Studios, where, as at so many other media companies, shorts have become a trendy way to try things out. "The stakes are a little lower, you have permission to take greater risks in shorts," Shurer says. Risks on technology, on ideas, even on people: At Disney's animation shop, Shurer says, everyone in the company gets to pitch ideas for shorts — from the president to the janitor. Disney's Oscar-nominated animated short this year was originally proposed by a story artist. You've seen Get A Horse if you've seen the movie Frozen. It takes some of the oldest existing animated footage of Mickey Mouse — complete with voicing by Walt Disney — and throws just about every kind of new technology imaginable into the mix. "I had never seen anyone break barriers between 2-D CG and 3-D all within one shot," Shurer says. "This is something that's never been done before." Shorts are also a way for filmmakers to gather feedback, explore tertiary characters and hype other projects. There's also something liberating about shorts that's not limited to animation. Filmmaker Nick Reed felt freed by the idea that his movie could be just as long as it needed to be. "I wanted to make a film that, when you finished it, you went, 'I want more,'" Reed says. Reed produced the Oscar-nominated short documentary The Lady in Number 6: Music Saved My Life. It's about Alice Herz-Sommer, a Holocaust survivor who lived to be 110 years old, and who died Feb. 23. Herz-Sommer was a musician in the Theresienstadt concentration camp. "As amazing as she is, my fear was if you make a 90-minute or a two-hour film, you lose the power," Reed says.